Ruan drivers are respected team members whose contributions, both large and small, are appreciated and noticed. You are the Captain of the Ship when you are behind the wheel of a Ruan truck. The work you do is vital, and Ruan understands that safety and respect are keys in every aspect of getting the product you haul from point A to point B, and getting you home safely after each trip. Summary Information: JCI Batteries - Dedicated National Customer! 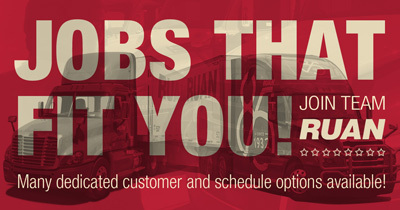 Ruan Transportation is hiring full time regional drivers to haul batteries for the Northwest Region for our dedicated national customer based in Canby, OR. Drivers will deliver palletized batteries via an electric pallet jack and pick up return core. Most runs will leave on Sunday with multi stops loads, may take 1 to 2 loads per week and home most weekends. Area of operations includes OR, NOCAL, WA, ID, East NV, MT . Drivers will average $ 80,000 annual and enjoy a collective bargaining agreement. A hazardous material endorsement required within 60 days of hire and Ruan can help to obtain. We are now offering a $4,000 Sign-on bonus! Sign-on Bonus pay outs are $1,000 paid 30 days after hired, then 4 more equal payments quarterly until paid in full. Local Management. You are not just another number!